What's the Difference Between Google Chromecast and Apple TV? Devices that bring web-based entertainment platforms like Netflix and Hulu to your TV are some of the hottest gadgets these days, and two of the most popular options are Google Chromecast and Apple TV. Both are small, relatively inexpensive devices that connect to your TV and stream all kinds of content, but they differ in significant ways. Apple TV and Google Chromecast do two different things. Apple TV gives you everything you need apart from a TV and an internet connection. That's because it has apps built into it including Netflix, Hulu, YouTube, WatchESPN, HBO Go, and dozens of other services. If you already have a subscription to one of these services, you can start enjoying entertainment right away. Google Chromecast, on the other hand, doesn't have any apps installed on it. Instead, it's basically a conduit by which a computer or smartphone that has certain apps installed on it can broadcast to a TV. Not all apps are Chromecast compatible (though there is a way around that, as discussed below). You can use Apple TV directly with a television without the need for additional hardware, but using Chromecast requires a computer or a smartphone as well. Devices running iOS, like the iPhone and iPad, as well as computers running iTunes, can control an Apple TV. Both iOS devices and iTunes have AirPlay (Apple's wireless streaming media technology) built into them, so there's no need to install additional software to use them with the Apple TV. If you use an Android device, however, you must install software to make it communicate with the Apple TV. Chromecast, on the other hand, requires that you install software on your computer to set up the device and to send content to your TV. For smartphone apps, there's no built-in Chromecast support in the operating system, so you have to wait for each app you want to use to be updated with Chromecast-compatible features. Apple TV is more tightly integrated with its compatible devices than the Chromecast. Apple TV is made by Apple while Google makes the Chromecast. You'll get the best experience with the Apple TV if you have an iPhone, iPad, or Mac. That said, Windows computers and Android devices can work with the Apple TV too. Chromecast is more platform-agnostic, meaning you'll have about the same experience with it on most devices and computers. However, iOS devices can't mirror their displays; only Android and desktop computers can (see below for more information about display mirroring). Both devices are fairly inexpensive, but the Chromecast carries the lower sticker price at $35 compared to $150 for the Apple TV. While Apple TV has lots of apps pre-installed, users can't add their own apps to it. Therefore, you're limited to whatever Apple gives you. With the Chromecast, you have to wait for apps to be updated to include compatibility with the device. Many, but certainly not all, apps work on both devices. One cool workaround for apps that aren't Apple TV or Chromecast compatible is to use a feature called display mirroring. This tool helps you broadcast whatever is on your device or computer screen directly to your TV. The Apple TV includes built-in support for a feature called AirPlay Mirroring from iOS devices and Macs, but it doesn't support mirroring from Android or Windows devices. Chromecast supports display mirroring from Android devices as well as from desktop computers running its software, but not from iOS devices. In short, both devices support mirroring, but they favor the products from their parent companies. Both the Apple TV and the Chromecast can deliver non-video content like music, radio, and photos, to your home entertainment system. The Apple TV provides built-in apps and features for streaming music from iTunes (either your computer's iTunes library or songs in your iCloud account), iTunes Radio, internet radio, and podcasts. It can display photos if they're stored in your computer's photo library or in your iCloud Photo Stream. Chromecast doesn't support these features out of the box. Some common music apps, like Pandora, Google Play Music, and SoundCloud support Chromecast with more being added all the time. Overall, the difference between the Apple TV as a platform and the Chromecast as an accessory is that Apple TV delivers better on more varied types of content, for now at least. 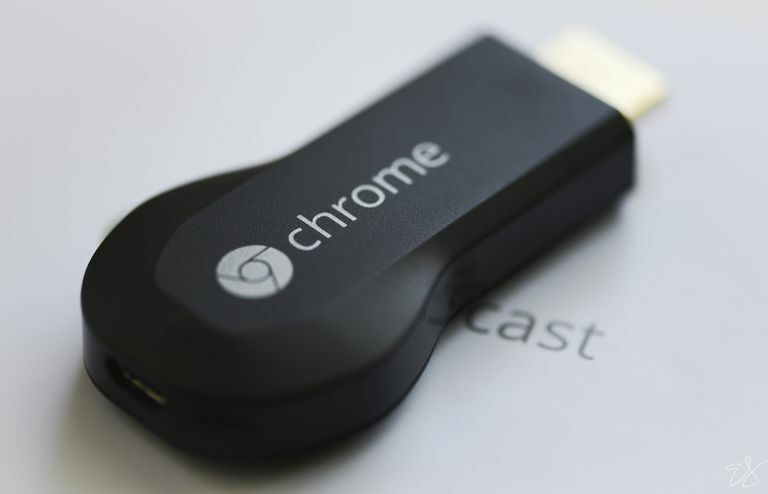 Chromecast may end up with more options, but presently it's a bit less refined. You may enjoy the Apple TV more if you use other Apple products, yet the Chromecast might be more ideal if you rely on Android devices.